Hubert de Givenchy created Audrey Hepburn's "Breakfast at Tiffany's" dress along with so many other famous looks. He created the most famous little black dress in movie history. Hubert de Givenchy, the French designer behind Audrey Hepburn's most famous looks, has died at 91. 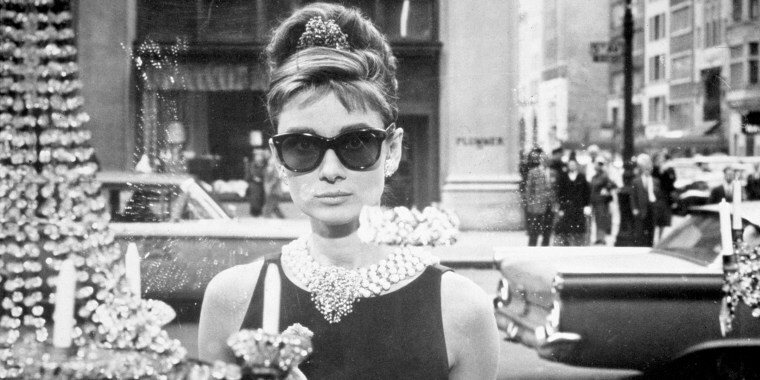 “The little black dress is the hardest thing to realize, because you must keep it simple,” Givenchy said in 2010, recalling his work on "Breakfast At Tiffany's." He also created this chic cocktail dress for the film. Givenchy designed outfits for many of Hepburn's other films, like this strapless, floral gown in 1954’s “Sabrina." She exuded confidence in this iconic scene from 1957's "Funny Face," wearing a striking Givenchy gown with a gauzy shawl. Hepburn also trusted Givenchy to design many of her personal ensembles, including the sweeping, romantic floral gown she wore to the 1954 Oscars. Hepburn did a spread for Vogue in 1963 celebrating her longtime collaboration with the French fashion icon. She posed for the magazine in a dreamy tulle gown and veil along with her first husband, actor Mel Ferrer. She could not have been cooler — or more '60s — in this Givenchy outfit with a geometric hat, sleeveless blouse and tweed skirt for Vogue. She also looked playful and radiant in this embroidered Givenchy dress cinched with a bow. Hepburn and the designer remained close friends until her death in 1993. Givenchy later remembered the actress as "fresh, unique, loyal, wonderful." Hepburn may have been one of Givenchy’s most treasured friends and muses, but he also designed iconic looks for celebrities including Grace Kelly, Lauren Bacall, Greta Garbo and Jackie Kennedy. He designed Kennedy’s dress for her first official state visit to France in 1961. Givenchy helped shape the first lady's signature style, designing this chic tweed suit for her France visit. "Project Runway" judge and Elle editor-in-chief, Nina Garcia, also mourned the designer's passing on Twitter. And stylist and fashion journalist Joe Zee joined many others on social media by celebrating Givenchy's legacy and his storied friendship with Hepburn. "The idea of designer and muse can be an overused idea in fashion, but Hubert de Givenchy and Audrey Hepburn was one of true collaboration," he wrote. "This weekend we lost another fashion genius. Heaven just got a little more stylish with these reunited fashion soulmates."